4" Connection. Pump up to 1,120 GPM with 3” solids handling capability. 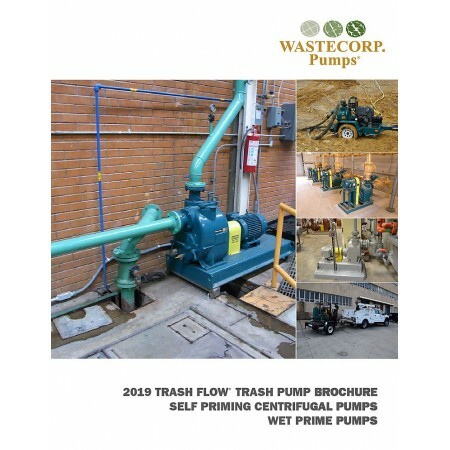 Trash Flow TFCC-VP-4 self priming centrifugal pump is available in bare pump, close coupled, belt driven, piggy back stationary, trailer mounted, skid mounted or lift station configurations. 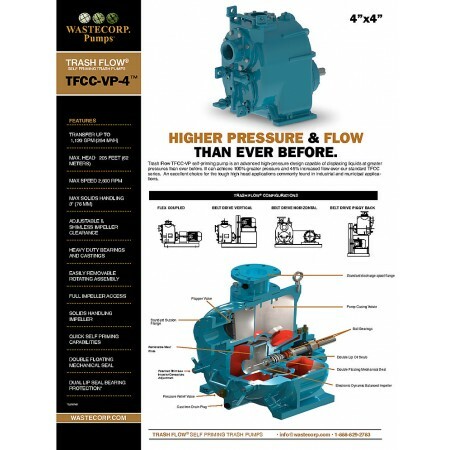 The Trash Flow TFCC-VP Series features a large volute design and enhanced re-priming capabilities. 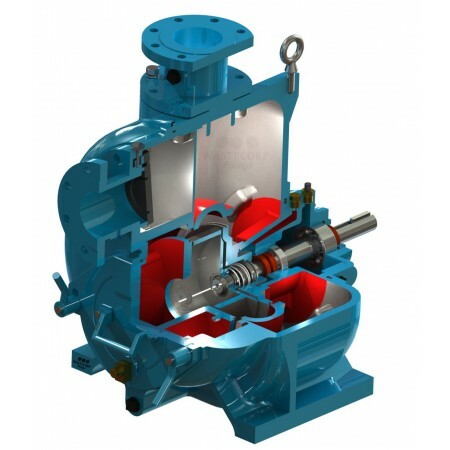 TFCC-VP pumps are designed for municipal wastewater pumping and industrial solids handling. Solids handling capabilities up to 3”. Direct drive, close coupled, belt driven, trailer mounted or sewage lift station models available for every wet prime pump model we manufacture. Trash Flow components can be adjusted and replaced to renew pump performance. No disassembly or shim requirements are necessary. The Trash Flow’s back pull-out design enables maintenance staff to quickly service the pump safely without the need for special tools. Operators can easily inspect and service the clean-out without draining the pump casing. Wastecorp Trash Flow pump products are available within 3-6 weeks for standard self priming products. Custom pump configurations may require longer lead times. Wastecorp adheres to the highest quality pump manufacturing and reduced environmental regulations. The Trash Flow is ISO 9001 and ISO 14001 certified. The best part is, your Trash Flow is manufactured close to home.